Iceland gets a bad rap. Or worse, it gets no rap at all. It’s the Guy Pearce of travel destinations- a great place with a rich and colorful history, tons of potential and more than worth the effort and attention but at the end of the day, still considered the poor man’s Paul Newman. Not true. This is a land of vikings and fjords, glaciers and whales, volcanoes and reindeer. It’s the kind of place where the Prime Minister’s number is listed in the phone book and the national food is a hot dog. Believe. To get you started on your Iceland adventures, here are nine surefire activities that you can’t miss on this memorable island. Sure it’s the most visited site in Iceland, but with good reason. Iceland is one of the most water-obsessed cultures I’ve ever encountered. Even for an island, these people love all things hydro. They drink pure glacial runoff, their homes are heated by geothermal power and most everyone swims in heated, mineral rich pools on a daily basis. The Blue Lagoon is different. First, it’s manmade (a byproduct of the nearby geothermal plant). Second, it’s a giant tourist trap (think Disney with bathing suits). Buses and cars and camera-toting gapers all line up to shuck over $35/person and soak in this silica rich, blue-green hot spot. The facility runs like an Italian train used to and a Swiss watch still does. Each person receives an electronic wristband that activates an elaborate locker system and qualifies for cashless purchases at the swim up bar (beer!). Water temperatures hover between 98-102F and strategic pots of white silica mud offer a do-it-yourself mud mask. As with all Iceland water spots, bring your own towel, relax and stare at the eerie black lavascape. Reykjavik is a walking city and there is no better place in town to get a lay of the land than the bell tower at Hallgrímskirkja. The church itself is an architectural marvel – reminiscent of a giant ship preparing for takeoff. At roughly 245ft, this is Iceland’s tallest building and the panoramic view from the top is something to behold. Take in Reykjavik’s classic colored rooftops, Mt Esja and the Seltjarnarnes Peninsula. 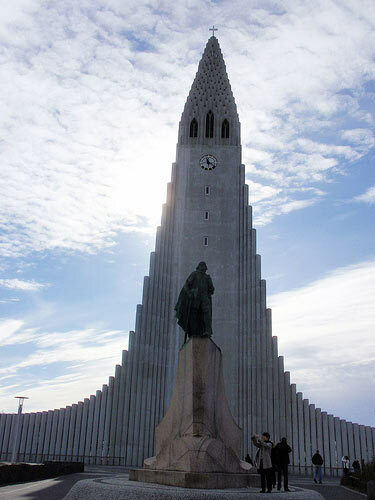 As an added bonus, a statue of Leif Eríkson is displayed in front of the church and makes a great photo-op. Humarhusid, also known as The Lobster House in the heart of downtown Reykjavik serves one of Iceland’s most unique and delicious delicacies – the “Icelandic Lobster” or langoustine. The most popular way to enjoy this dish is simply grilled with garlic sauce. Because these crustaceans are typically smaller (about the size of a giant prawn) you get at least seven tails. Taste and texture eclipse anything you will have experienced, and I’m no fan of traditional lobster. Other items on the menu include whale sashimi with ginger mango, radish, wasabi and mushroom truffle dipping sauces, fresh salmon with parsnip, apple and mayo, and my personal favorite – a twist on the classic Surf & Turf consisting of horse tenderloin and lobster. Trust me. 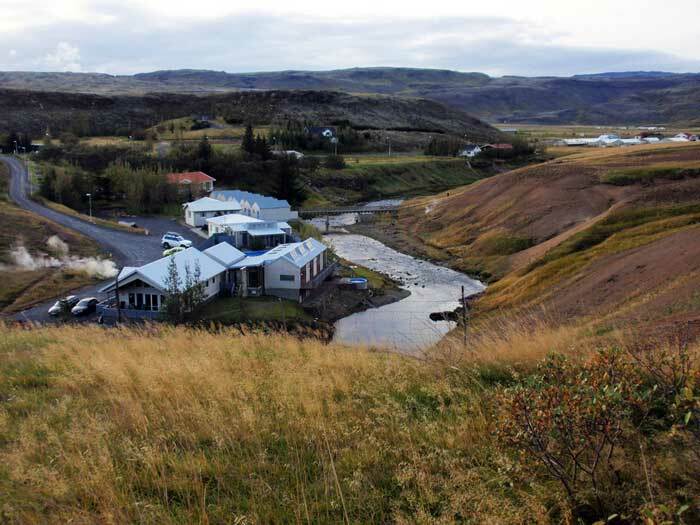 The Frost and Fire Guesthouse is conveniently located less than 30 miles from Reykjavik in the sleepy yet volcanically-active town of Hverageroi. It’s a good base of operation to explore South Iceland and the “Golden Circle” especially if you want to get out of Reykjavik. The guesthouse features standard Ikea furniture, private bathrooms and a TV/DVD combo along with a complimentary organic breakfast. Where Frost and Fire really beats the band is the assortment of soaking options. Each room has walk-out access to a giant geothermal hot tub, two steam rooms and a decent sized heated pool. Sulfur is rich in the air and creaky pipes protrude from the ground, spliced in from nearby underground thermal pockets but sitting in your own semi-private hot pot looking down at the winding stream and steaming hillside after a day in the countryside is hard to beat. Comfy bathrobes are provided for your dipping pleasure. The true beauty of Iceland starts to unfold as soon as you hit the road. Pick any direction and start driving. Route 1, the Ring Road, circles the island so it’s almost impossible to get lost. Almost immediately Iceland’s tendency to surprise becomes apparent. Snow-capped mountains rise out of meadows dotted with grazing sheep and running glacier runoff. Geological oddities, moss-covered lava fields, plunging cliffs and twisting shorelines bleed into random waterfalls, geysers and smoking thermal pools. A 40 mile drive in the country can easily take all day. Look for the hundreds of Apple command key symbols (St. John’s Arms) which indicate places of interest or stop when the spirit grabs you. One thing you won’t see is traffic. Outside of the few dense tourist areas, sheep outnumber cars and you can drive hours without seeing another person. Glaciers cover over 11% of the landmass in Iceland. They loom. Ancient, deliberate, colossal things that beg for inspection. Guided tours are available for most of the 13 major glaciers and are recommended if you want to explore any of the interiors. However, most of the “tongues” are accessible from highway pull-offs and it’s possible to hike within spitting distance if you want to drink fresh glacier water or chip away a souvenir. The national (alcoholic) drink of Iceland might very well be Brennivin – a sort of schnapps made from potatoes and caraway. Known affectionately as “black death,” it’s a nice jolt after braving the whimsical Icelandic weather. Enjoy a few blasters with some Viking beer while rubbing elbows with locals at the cozy, wood-paneled Dillon bar in Reykajvik where bands play energetic rock, rhythm and blues. The swimming pool complex in the Arctic harbor town of Akureyri might be the best pool I’ve ever seen. 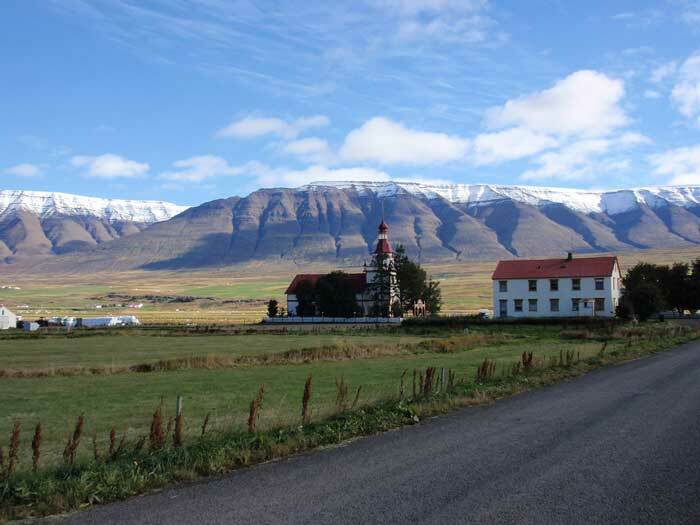 The town lies in the crook of a fjord and is surrounded on both sides by sloping mountains. 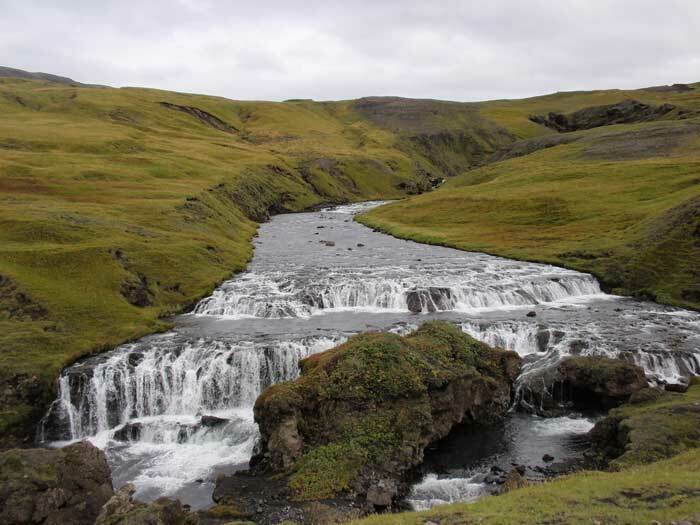 The Sundlaug sits at the top of a hill and since all the lanes are heated to 85F, you can float or swim surrounded by the spectacle of natural Iceland. The complex also boasts indoor and outdoor competition pools, 4 geothermal hot tubs (109F), a Turkish bath, sauna, and even a water slide. Hard to beat for roughly $2 per person. In the small fishing hamlet of Höfn there’s a restaurant you’d expect to find in New York, Tokyo, Paris or Rome. The Humarhofnin sits within view of the fishing boats that provide its lobster and arctic char. Farm trucks haul in lamb. Fresh herbs grow in pots on the window sill. The emphasis is on freshness and simplicity. Fresh bread and creamy Iceland butter are accompanied by crisp white wine, a simple fresh green salad and plate of a dozen langoustine tails with herbed sauces for dipping. The mood is light and the service is homespun and friendly. Iceland is a difficult place to reduce to a top nine list. The land has a freestyle, seat-of-your-pants feel to it that almost requires you throw any plan out the window. Considering the second largest city has a population of 15,000, sheep outnumber people and an overwhelming number of adults believe in elves, Iceland is undefinable, mostly untouched and certainly worthy of repeat visits.